I was planning to write about urban gardening next. However, as I began my research, I ran across a term that was unfamiliar to me…food deserts… so I dug a little deeper. I wondered. What is a food desert, exactly? On the surface, it seems to be a contradiction of terms. By some serendipitous twist of fate, later that same day (really), I took a break from my work and made a quick trip to the grocery to pick up a fresh loaf of bread. My local store was busy with people stocking up for an impending stretch of extremely cold weather. I quickly completed my shopping and made my way to the exit. I walked past the first few cashiers, swamped with customers, to the last checkout where the line was surprisingly short. As I began to empty my cart onto the conveyor (I can never leave the grocery with just a loaf of bread), I realized that the young woman ahead of me was paying for her groceries with food assistance checks (a rarity in my suburban neighborhood). The cashier kept up a friendly conversation with the woman, complementing her on the beautiful baby that was wrapped in blankets and sleeping in her cart. It took a little longer for her to complete the transaction, but the cashier’s pleasant demeanor never wavered. An older woman, who I presumed had accompanied the mother and daughter, stood off to the side and watched. When the cashier was finished, she wished them well and the three women left, smiling. As I continued to unload my cart, the older woman returned to the cashier, gave her a big hug and thanked her for her kindness. It turns out that she was a Good Samaritan who offered to drive her neighbor to the grocery when she ran out of baby food. She had been stranded without a vehicle and the woman offered to help. In the parking lot, I saw them again. The wind was howling and blowing the snow sideways. I thought about the baby wrapped in blankets. As I pulled away, I noticed that my car thermometer read -2° F.
Right then and there, I reminded myself to be more aware of the people around me. I also realized that food insecurity isn’t just a problem reserved for the urban poor or developing countries; it exists in communities all across the United States… sometimes in places where we least expect it. According to a report to Congress prepared by the U.S. Department of Agriculture, approximately 2.3 million households in the United States are more than a mile from a supermarket and lack access to a vehicle. That’s not 2.3 million people… that’s 2.3 million households. Think about that. Your refrigerator is empty and the nearest food store is more than a mile away. Now, if you’re living in the city, you may have the option to take a bus or the train to restock your food supply. But what if you live in the suburbs or in a rural area? What if it’s -2° F and you have a hungry baby and no car? What then? 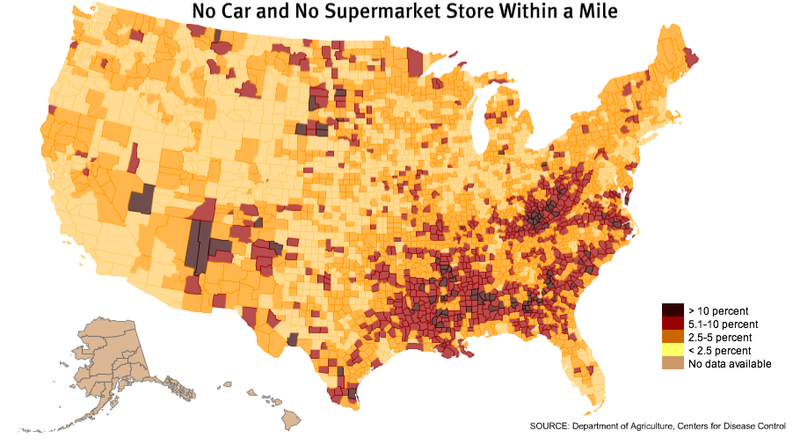 The main measurement used to classify a food desert is the distance from nutritional food retailers. Further, proximity is not the only factor, as individuals may live close to a retailer that provides nutritious food, but the healthy food selections may be more expensive, creating an additional barrier to access. The physical distance from full service supermarkets also leaves residents of these areas more likely to purchase food from convenience stores or fast food restaurants that offer mainly processed foods that are high in fats and sugars. In 2010, Michelle Obama brought national attention to the problem of food deserts during the launch of her Let’s Move! campaign. This initiative is dedicated to giving parents helpful information about maintaining a healthy diet and links to programs that promote active lifestyles. It also advocates for nutritional menus in our schools and is working to ensure that every family has access to healthy, affordable food. Recent findings show nearly one in three children in America are overweight or obese. If we don’t change our current habits, one third of all children born in 2000 or later will suffer from obesity-related health problems like heart disease, high blood pressure, diabetes, cancer, and asthma. Part of the problem stems from the fact that we have become a nation dependent upon others for our food production. We rely on imported products and ship domestic produce thousands of miles from its original source. This has not only increased our transportation needs and carbon footprint, but it has also put local farmers out of business. Although we will realistically never return to the agricultural roots of years past, we can all make an effort to increase the amount of locally grown products we consume. This is not a problem that has a one-size-fits-all solution. We need to address the issue at the local level and tailor solutions according to each region and specific growing season. As the trend toward sustainable lifestyles continues to grow, seasonal farmer’s markets, home food delivery programs, backyard gardens and urban farms are cropping up in communities across the country. Creating a healthy relationship with food doesn’t have to be all work and no play. It may quite possibly serve a dual purpose. Researchers recommend that creating a direct connection between fresh produce and the consumer is an excellent way to promote healthy and sustainable lifestyles. Examples of this include urban farm programs; learning how to a start backyard or patio garden; and school programs… all great ways to experience nature and get outside and active. As Americans, we are blessed to live in a country where the rights and privileges of its citizens are protected by law… Where nearly anything is possible if we are willing to work hard in order to achieve our goals. However, the system and its citizens are far from perfect, and with these rights come responsibilities to each other. Unfortunately, we are often quick to defend our rights, but much more reluctant to live up to our responsibilities. There needs to be a more equitable balance between the two. There is no reason that a young mother should wonder how she’s going to feed her baby in the middle of a snowstorm. It takes a village to raise a child and that should still be the number one priority of communities not only here in the United States, but around the world. I hope you will join me in helping others in need. I believe they come across our path for a reason. At the very least, offer a smile to someone who could use a little encouragement. 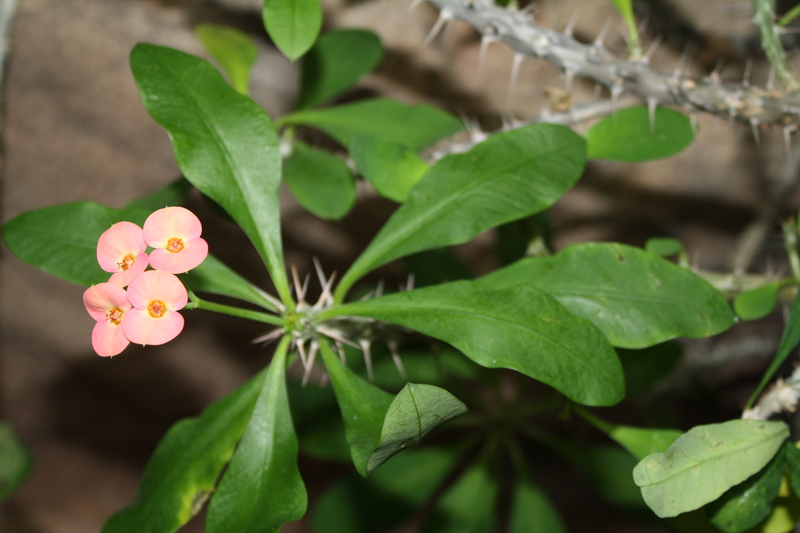 Like a flower in the middle of a desert, it may just brighten their journey.